Do You Have Your Lenormand Reading? Online Lenormand readings have been discontinued. I want to thank all of my clients over the years for their immense trust and loyalty. For a while, I have received nudges that I should stop doing readings, but I ignored them because I truly enjoyed working with everyone and didn't want to stop. It has now become obvious to me that I need to make changes to my working life, and that includes discontinuing readings. Thank you for all of your support over the years! I wish you the best in everything life has to offer. Imagine: You are about to learn what potential challenges and opportunities await in your future, and how you can best navigate them. This is a one-of-a-kind Lenormand reading where I help you gain insight into the people and circumstances surrounding you. I tell you story after story in your Lenormand reading of what actions you can take that will most likely lead to your desired outcome. As you read, a sense of wonder will awaken within you. I'm a professional Lenormand reader with over six years' experience reading Lenormand cards. I am passionate about using Lenormand to help you receive insight and clarity into your personal life. In my readings, I do more than simply tell you what the cards mean. I provide you with a one-of-a-kind reading that will allow you to see your situation from multiple angles and will empower you with the knowledge you need to move forward. During your Lenormand reading, I will use proven techniques to help you discover your future, helping you to be better prepared for what will come. You will clearly understand the guidance and messages received to help you choose the best paths to take. You will know what potential challenges and opportunities await in your future, and how you can best navigate them. 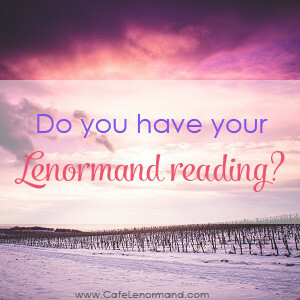 When you book an email Lenormand reading with me, I'll ask you to give me your question. This will allow us to begin your Lenormand reading. Focusing on your question and tuning into your energy while I shuffle the cards, I will then draw the cards for you and perform your Lenormand reading. The cards will be carefully analyzed to uncover all of the messages, insights, and possibilities they reveal. Your Lenormand reading will be written, allowing you to return to it at any time. It will be sent to you as a PDF document, with images of the Lenormand cards used in your reading so that you can see the cards and follow along with the reading.